These Black Bean and Guacamole Tostadas are the perfect example of Mexican cuisine’s generous reward-to-effort ratio. You get so much in return here for doing so little work. 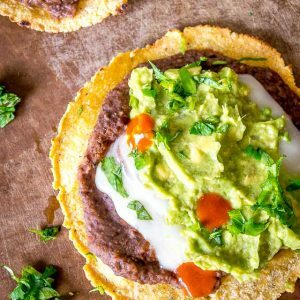 And not only that, you’ll probably have black bean puree leftovers, which means for the next few days you can whip up killer insta-meals whenever you get the craving. Yes, we’re using some homemade corn tortillas made from fresh masa. And yes, when you crisp them up in some oil they are gamechanging. But they aren’t the main attraction here. You can use any corn tortilla and still get a meal that will easily put your local taco joints out of business. Why? 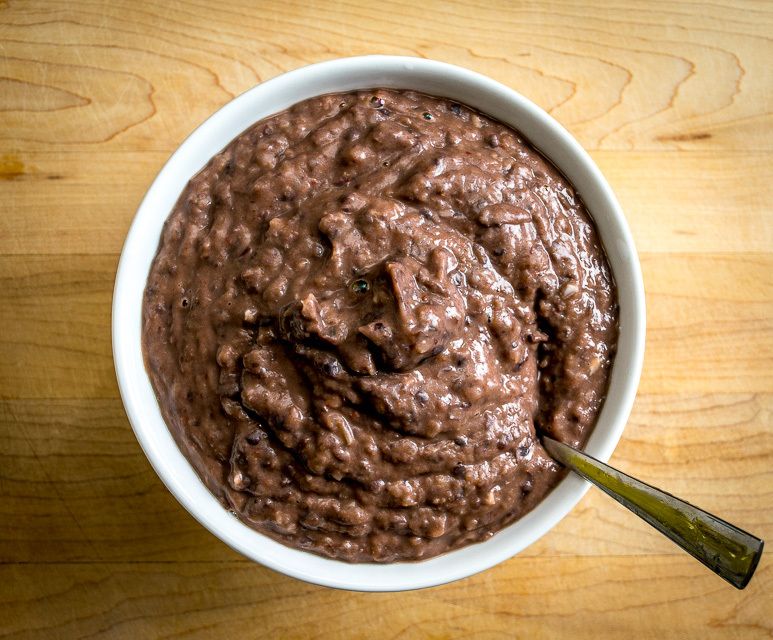 Because the black bean puree has so much flavor it will instantly have you dreaming up other ways to use it. It’s the same delight we use in our Spicy Black Bean Nachos and it’s worth getting familiar with it. Start by cooking 1/2 an onion and 2 garlic cloves over medium heat. All of this will be going in the blender eventually so you can chop roughly. Let this simmer for 5 minutes or so and then combine it well in a blender or food processor. And now the important part: take a taste! The amount of sodium in canned beans varies widely, so if you feel you need another pinch of salt then now is the time to add it. It’s surprising how much the flavor of this puree can change just by getting the salt level to your liking. Tastes good eh? But don’t eat it all yet! You’ve still got some guacamole to make. Using the proportions in this pic is the fastest way to whip up some Guac. I’ll put instructions for the Guac in the recipe box below, but basically you are finely chopping a few tablespoons of onion, smooshing it with the back of a fork, and adding it to the avocado, lime, and salt. Super fast and super rewarding. Noticing a theme here? So instead of submerging the tortilla in oil, we are simply adding a thin sheen of oil to the pan, probably 1/4 teaspoon or so to start with. This is enough to make the tortilla crispy ‘enough’ and it still gives you that recognizable flavor of fried corn. You might need to replenish the oil as you continue to cook the tostadas, but start small as it’s surprising how little oil you need to give it that familiar crunch. Adding a little weight will help the tortilla crisp up, so I usually cook them with a layer of the bean puree and plenty of cheese. It’ll need 1-2 minutes depending on your skillet. When you’ve got some heavy brown spots forming on the underside then it’s chowtime. Top with guacamole, cilantro, and of course a few drops of hot sauce. For me, that means Valentina. Tomatoes, onion, Cotija and Crema are all worthy options to help create your own personal tostada delight. These are best eaten within moments of coming off the skillet, so don’t let them cool off too much before chowing down! Serious reward to effort ratio in these tostadas! 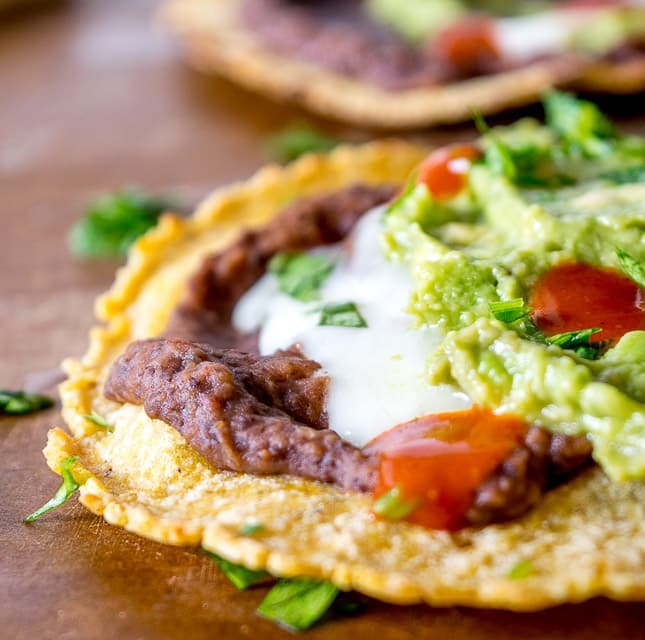 We're crisping a corn tortilla and loading it up with spicy black bean puree and a refreshing guacamole. For the black bean puree, roughly chop 1/2 an onion and peel 2 garlic cloves. 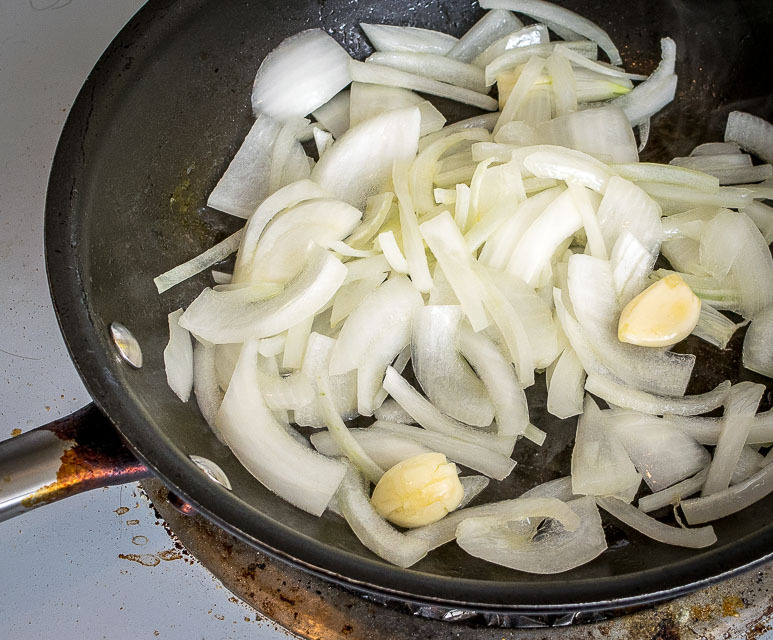 Saute the onion and garlic in a dollop of oil over medium heat for 5-7 minutes. Drain and rinse one can of black beans. 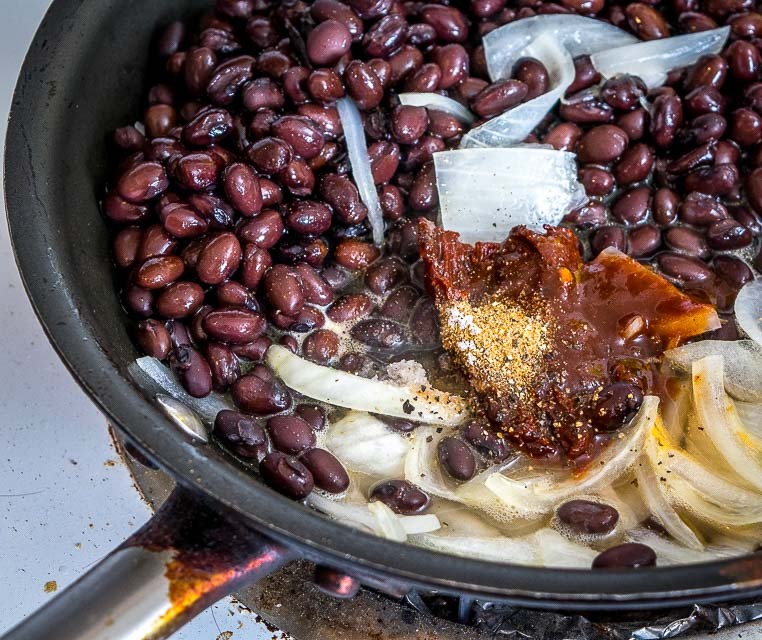 Add the black beans to the onion mixture along with 2 chipotles in adobo, 1 Tablespoon adobo sauce, 1/2 teaspoon cumin, 1/2 teaspoon salt, freshly ground pepper, and a splash of water. Simmer for a few minutes until heated through. Combine the bean mixture in a blender or food processor. Salt to taste (I added another pinch to this batch). For the Guacamole, finely chop 2-3 tablespoons of onion. Use the back of a fork to smoosh the onion until it turns translucent. 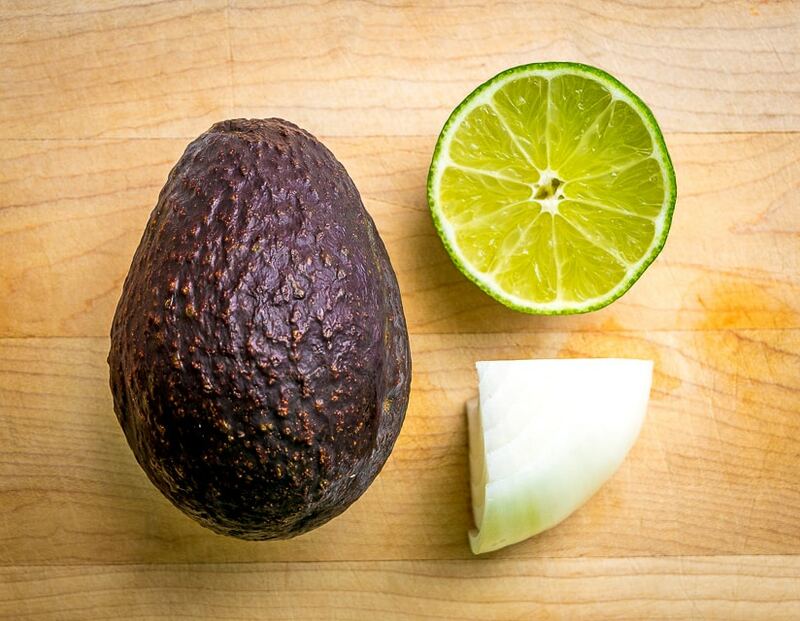 Add onion to a bowl along with the avocado flesh, 1/4 teaspoon of salt, and the juice of a half lime. Mush and mix well. Taste for salt level and keep adding tiny dashes of salt (and lime) until it tastes right to you. Add a thin sheen of oil to a skillet over medium heat. 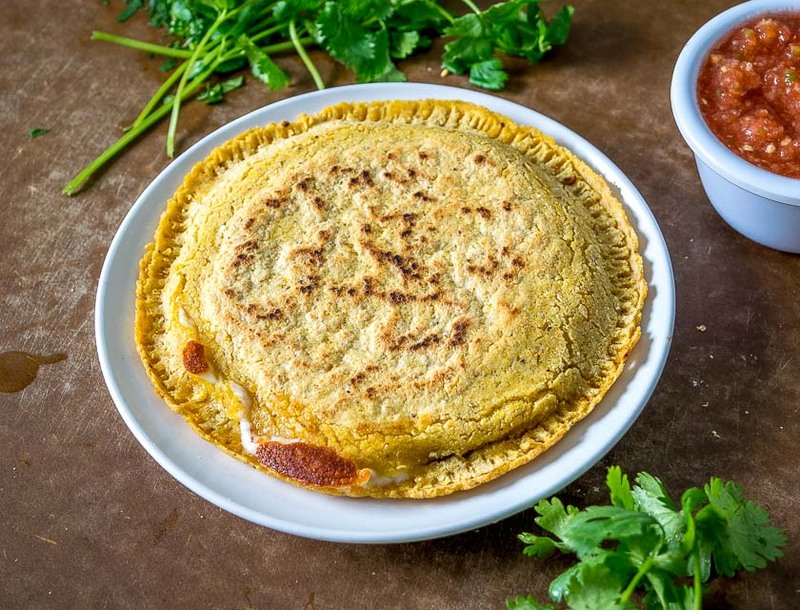 Add a layer of beans and cheese to each tortilla and cook them in the skillet for 1-2 minutes or until they have brown spots on the underside. 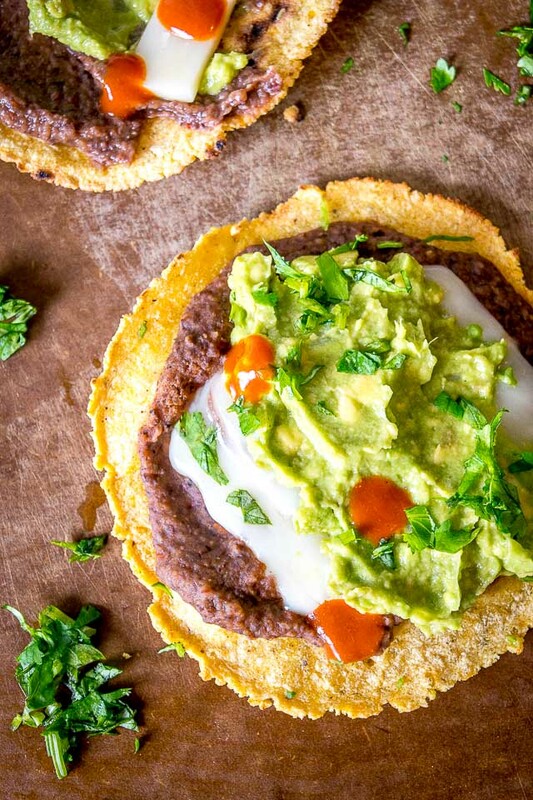 Top with guacamole, cilantro, hot sauce, and any other toppings you want. Serve immediately. 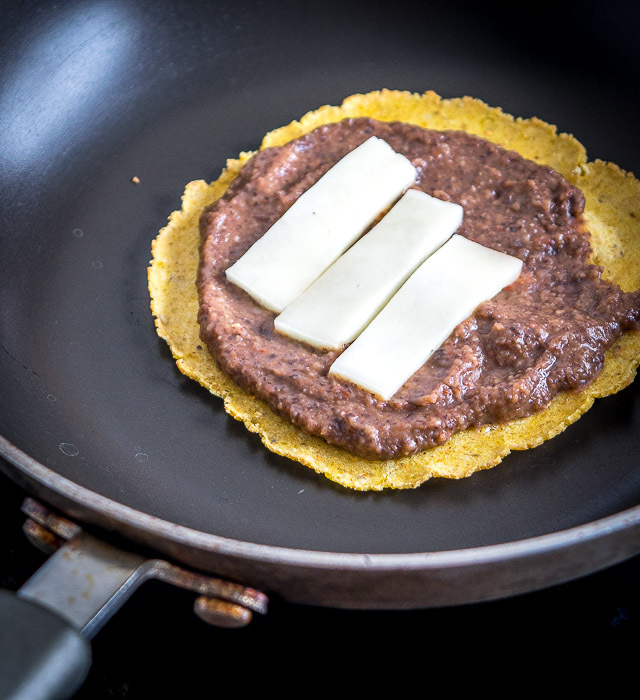 I like to use as little oil as possible so sometimes it can be easiest to add a small drop of oil to the skillet and then rub the tortilla in the oil before adding the beans and cheese. Alternatively, you can use store-bought tostada shells. You can also use the black bean puree in these tortilla pockets. 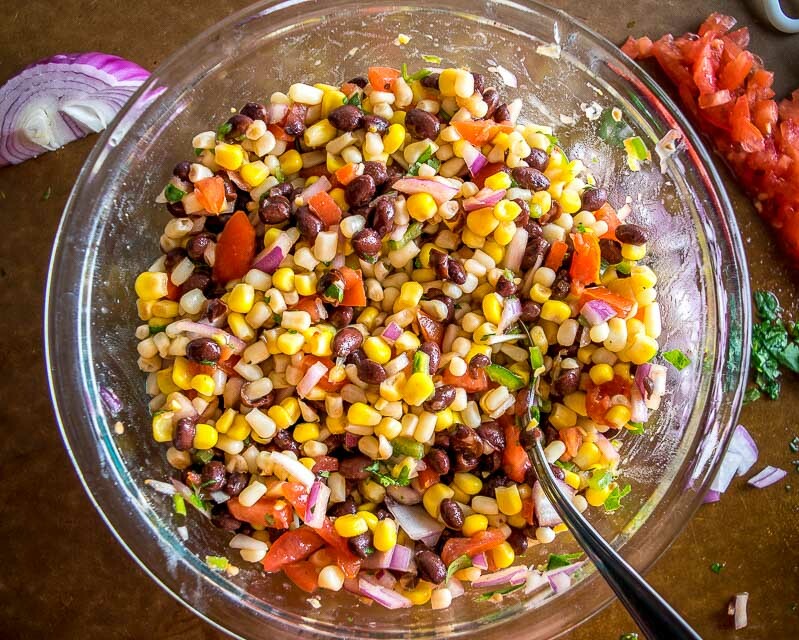 Or consider making these tostadas with our Black Bean and Corn Salsa.